It’s easy to make fun of Engage, the analytics app launched by Twitter today. Using terminology like engagement, influencers, and verified users, Twitter isn’t doing itself any favors. But here’s the thing, Twitter is different things to different people. For some it’s a public forum for chatting with friends. For others, Twitter is a broadcast medium. For still others, Twitter is all about marketing. Engage is designed to help you maximize the reach of your tweets through analytics. If that’s not your thing, you may view the app as useless, but that doesn’t mean it should be dismissed out of hand. What Engage does, it does well. This is not a replacement for your Twitter client, including because it pops up an alert offering to track your tweet stats in real-time after every post. Engage is more akin to a tool like Google Analytics. Engage is divided into three tabs: ‘Engage,’ ‘Understand,’ and ‘Posts’. Engage is further divided into ‘Top,’ ’Mentions,’ and ‘Verified.’ ‘Top’ is a chronological list of ‘influencers’ and verified users that have interacted with you, along with anyone who has followed you. Mentions is another chronological list of tweets that mention you, and ’Verified’ further filters the Mentions list to show mentions from verified users only. 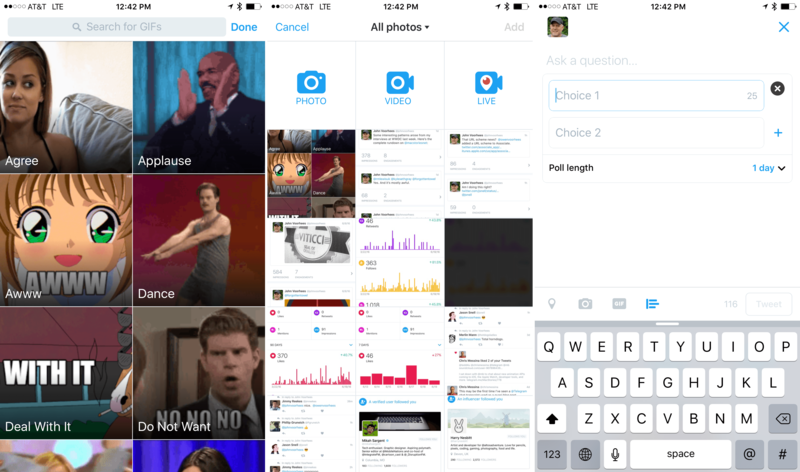 Engage can find GIFs, post photos and videos, create Periscope feeds, and polls. ‘Understand’ provides statistics on likes, retweets, mentions, impressions and other metrics over the past 24 hours or 7, 30, or 90 days. ‘Understand’ also shows the hashtags your followers are using, what countries your followers are from, and the breakdown between male and female followers. ‘Posts’ is also broken down into three sections, ‘Video,’ ‘Photos + GIFs,’ and ‘Other.’ For each category of tweet, Engage displays the ‘impressions’ and ‘engagement’ of the tweet. Engagement is the total of your likes, replies, and retweets, but it isn’t clear how impressions are measured. ‘Other’ is any tweet without a video, photo, or GIF, demonstrating a clear preference for multimedia tweets. From wherever a tweet is displayed, you can reply, retweet, quote, or like it. The primary thing missing is a timeline of the all the tweets of the people you follow. You can also post tweets from within Engage with the compose button in the upper right hand corner of the navigation bar, but you will have to endure the alert that offers to track your tweet’s statistics every time you post. Twitter analytics tools are not new. 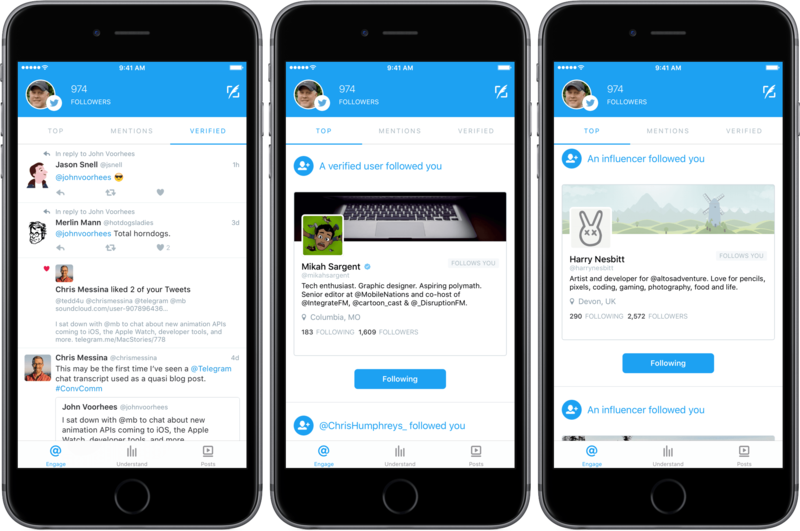 Birdbrain, Crowdfire, and Dashbird are all examples of popular Twitter analytics tools. 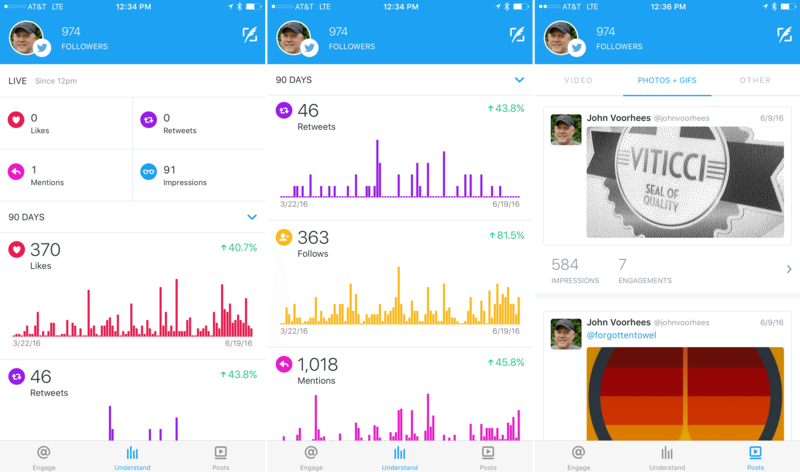 Engage does a solid job of displaying statistics and summary information about your interactions with other Twitter users, but misses some obvious opportunities. For instance, the impressions and engagements data presented in the Posts tab would be more valuable if you could filter it to organize tweets by the number of engagements or impressions in addition to displaying the tweets chronologically. There should also be a setting to turn off the alerts that offer to track your tweets in real-time. Clearly this app is not for everyone and that’s okay – not every app is. But if your business relies on having a presence online, there are worse things you could do than try a tool to get a sense for whether you are reaching the audience you want to reach. If you can check the eye-roll emoji at the door and get past corporate-speak terms like engagement, brands, and influencers, Engage is worth trying. Engage is available in the US App Store as a free download.